Myzdamena's World: I think I found my mojo! I think I found my mojo! Right behind the baked beans in Tesco! 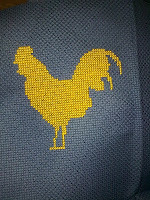 Thanks to the great Carmen I have found the most unsavoury delights of Subversive cross stitch! Show us, show us, show us! Most of my stuff isn't saucy! Show us! The cockerel is brilliant..we know where it's gona go, we're grown ups...have you read my article about the bo***cks machine? You can do it! I've come for a visit from UKS..and I have the subversive cross-stitch book! My son bought it for me while we were on holiday because most of the words in the book were the ones he used to describe holidaying with his parents lol. Oh! I've just followed that link and now I think I NEED to have that book! NEED!